Redlands, California—Esri, the global leader in spatial analytics, today announced that its innovative Ecological Marine Units (EMU) app is now available for mobile devices. 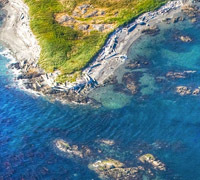 The app provides a valuable resource for scientists, educators, governments, and industries seeking easily accessible information and imagery about the ocean's long-term physical and nutrient properties. The EMU app puts data such as temperature, salinity, and dissolved oxygen from 52 million locations throughout the world's oceans at any user's fingertips. This data informs how livable marine environments are for ocean-dwelling species as well as the overall health of the ecosystem. Organizations involved in fishery planning, for instance, can use the EMU mobile app to review proposed boundaries with a better understanding of which habitats will likely harbor certain species and manage fisheries more cost-effectively. By using the EMU mobile app, industries that depend on fishing yields can spend less time and money on areas that are less profitable. Conservation groups that need easy access to information on the environments of marine protected areas (MPA) in order to more effectively regulate them now also have a mobile tool for understanding the chemical makeup of these areas. "The EMU mobile app will serve as a fresh, widely available resource for professionals who benefit from a deeper understanding of the ocean's structure—its salinity, temperature, oxygen levels, and nutrients," said Dr. Dawn Wright, Esri chief scientist. "Scientists and nonscientists alike who must study and understand the ocean now have the freedom of a convenient mobile interface with this vast wealth of environmental data." The primary data source for the EMU mobile app is the National Oceanic and Atmospheric Administration's (NOAA) authoritative World Ocean Atlas, with marine chemistry information from the National Aeronautics and Space Administration (NASA) and topographic data from GRID-Arendal. The app provides access to this globally comprehensive, data-driven 2D and 3D data and serves as an educational tool for easily understanding marine environments and how they are affected by climate change. The EMU mobile app is free from the App Store and Google Play. To explore Esri's Ecological Marine Units, visit go.esri.com/pr-emu.